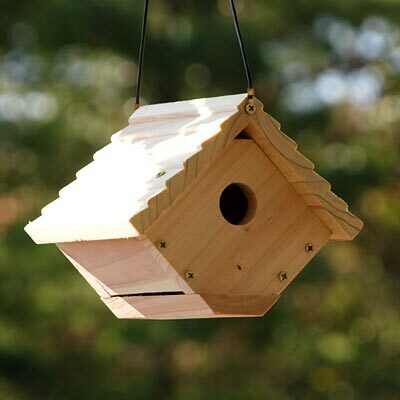 Create a classic look in your bird garden with the Woodlink Traditional Hanging Wren House. This functional and simple home offers wrens a ready nesting spot. A diamond-shaped frame on the top is finished with a flat base, creating a unique silhouette. A 1.25" diameter entrance hole is specifically designed for wrens to enter, preventing larger, more aggressive birds from overtaking the nest. A small gap at the top of the home on two sides keeps it ventilated, along with horizontal slots under the roof overhang. Two drainage slots on the bottom of the unit help keep the nest dry, and the 0.625" thick fir aids in insulating the home. Use the attached cord to hang this house from a hook or hanger, for easy access for the birds. The wooden construction makes an unassuming and sturdy home for several seasons. Invite wrens to roost in your garden with this Traditional Hanging Wren House.